Since we became used to buying off the rack canned goods, a lot of us may feel awkward about canning or preserving foods by ourselves. Others are hesitant as they think that preserving their own food is not as easy as they think. Actually, it is not because they do not like the idea of having canned and preserved foods at home. It is just that they do not know how to get on with it. For beginners in preserving foods, there are basic steps which will be of great help. Even though there are advanced food preservation techniques, preserving fresh foods is not another unfeasible goal. Simply, it is in your willingness to prepare the food for your loved ones. 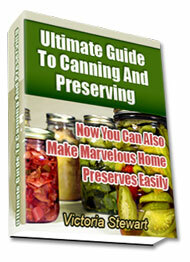 If you are sure that you wish to learn about food canning and preservation, you can absolutely do it. The aspiration to attain the knowledge of food preservation is what you have to consider and start to believe that you can do it. So, here are the simple steps in preserving foods which will be a beneficial gain both for you, your family and even your friends. As soon as you have decided to finally do it yourself, there are particular steps that you need to follow when it comes to preserving or canning foods. First of all, preserving foods starts with selecting which food to preserve. Should you have fresh vegetables and fruits from your own garden or farm, you can absolutely use them for preserving foods. If you do not have your own resource, you can visit local farmerís market for more fresh produce and foods. Either way, it is important to choose your favorite foods to preserve. And, more than choosing the food to preserve, collect all the necessary preserving supplies, tools and materials. Make an extensive list of all the necessary supplies that you will need. Put them all in your working table for the next step. This will save your time and your energy during the preparation. As soon as you have chosen which foods to preserve and have prepared the essential supplies, it is now time to be familiar with the techniques in preserving foods. Among the processes are freezing, drying, water bath canning and pressure canning. If you are already familiar which technique is appropriate for the food you have chosen, try it on. It is very important to determine foods ideal for preservation. High-acid foods prefer boiling water bath since the foodís acidic chemical composition allows bacteria to grow. The Clostridium botulinum is a source of fatal botulism toxin. High-acid foods include peaches, apples, cherries, berries, pears, plums, apricots and so many other fruits. Conversely, preserving foods in low-cid like poultry, potatoes, meats, fish, peas, corn, carrots, cucumbers, peppers and other vegetables need higher temperature within a pressure pot or canner.